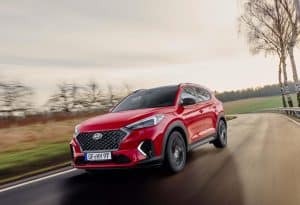 Hyundai has announced the release of a new N Line trim version of its popular Tucson SUV. The manufacturer is also adding a 1.6-litre hybrid version to its model range. Designed to be “sportier and more efficient” than the rest of the Tucson range, the N Line trim version offers more than just updated styling. It includes a number of tuning and performance upgrades to ensure a more responsive driving experience, but with enhanced green credentials. The model is available with four powertrain options and in both two- and four-wheel drive. It also features updated suspension and steering, as well as redesigned bumpers and a dark mesh-pattern grille. Furthermore, the addition of 19-inch alloy wheels, as well as side mirror housings and a rear spoiler in gloss black, emphasise the N Line’s sporting appeal. Full fuel consumption and emissions data is not yet available for UK buyers. However, the addition of a new lower-rated 1.6-litre hybrid option will help to ensure the model remains green and sustainable for fleet operators.